How badly are bloggers poisoning the well? 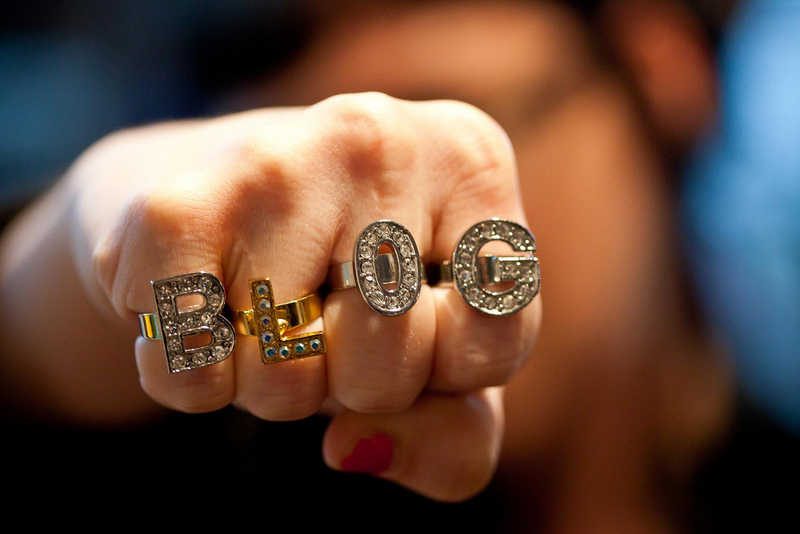 It’s still fashionable for brands and agencies to work with bloggers. How long will it be until it may be harmful to do so? The problem is with disclosure and authenticity. Bloggers aren’t keen on either and there’s danger that either the public or Google will notice. Google, in particular, is a stat crunching monster. Once the algorithm decides that mathematically the chances are that links from blogs will have been arranged or incentivized and therefore should be a negative quality signal rather than a positive one? I’m not just picking on bloggers in this post. Back in 2014 I wrote a piece that made it clear agencies and client-side teams were encouraging this behaviour by not refusing to take part. If a blogger takes cash for a piece and “forgets” to put nofollow on the links for Google or to clearly state “this is an advert” for human readers then all too often that’s seen as a bonus win. That same year I wrote tips for evaluating blogs that tried to steer people to safety. In particular, the Colleen/Jac test was designed to see whether the blogger actually had something unique to contribute or whether the platform was just sprouting reviews, rewiewbait (posts written to score freebies) and paid-for placements. Since 2014 I don’t see much of an improvement. I appreciate bloggers, more and more, want to make a living off their blogs. Blogs want to be treated like businesses. That’s fine. I just wish more blogs could actually be given business rates! What’s the average CPM for a remnant or RTB ad brought from a big brand publisher these days? A few pennies? Let’s pop over to the Passionfruit Marketplace and see what bloggers are charging. I like Passionfruit and they’ve given bloggers a better steer on what to charge than the current prices most bloggers ask for. $15 for a small banner shown to 1/5th of the blogs 6,000 pageviews. Weirdly the blogger says you're not allowed to promote anything with the banner. Using the two blogs who are kind enough to disclose traffic figures that makes an average of about 9000 pageviews a month (not uniques) for an average of about $105. That's a $86 CPM. A $86 CPM is ridiculous. There are good deals and less intelligent deals on Passionfruit. The goal of the above is to indicate just how rare traffic reporting is – bloggers much prefer social reach – and to indicate how expensive it is to advertise on blogs if CPM is your metric. Most brands and agencies don’t buy ads on small blogs though. They’re much happier (and better off) using advanced platforms in a real-time bidding systems to show the same people ads for one thousandths of the cost. What about disclosure and knowing when to nofollow links? 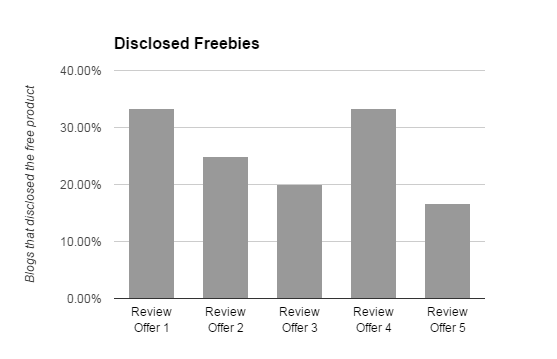 Using a platform (who’ve asked to be nameless) who email offers and opportunities to bloggers, I went through 5 “You get to keep the product” offers and found between three and six reviews from blogs for each. What percentage of bloggers disclosed they got the product as a freebie? What about nofollow links? Counting only the blogs that linked back. 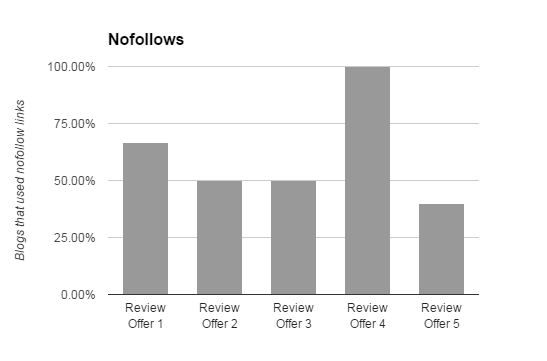 It’s great to see that %100 nofollow on an incentivized deal. That tells me either the bloggers – more likely the agency – knew the risks. It’s also worth noting that links were not an asked for requirement in Offer 5. That’s the review deal with the most follow links. That’s how it’s supposed to work. If links are editorial then you’ve more chance of scoring that positive quality signal. It’s also interesting to see that bloggers seem to be better at nofollow than they are at disclosure these days. That’s probably for two main reasons; the bloggers don’t want to risk Google anger whereas still too many bloggers don’t understand disclosure rules. If you were Google’s algorithm, though, you’d be able to read the clues clearly here. Sites that look like blogs have a high chance of linking out and, increasingly, those are links that shouldn’t count. The only way bloggers can ensure blogs remain positive quality signals is to keep those follow links rare, precious and appropriate. I’m a blogger. I see hope for the hobby. Travel, beauty and fashion bloggers need to work on their own personal brand as much as their blog – they need to charge celeb rates rather than platform rates. Gamer and gadget blogs have other ways to earn cash – gadget blogs, in particular, should do more with affiliate marketing. Gamer blogs have communities to grow.